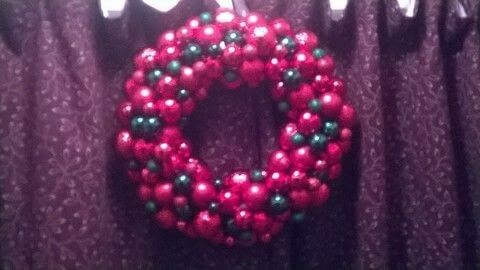 This Is made by glueing the baubles on to a wreath ring. It can be made in any colours or size. It does take quite a lot of baubles to cover the ring. I would also suggest that you cover the ring with ribbon or paint. I never did this and you can see the ring through the baubles at some points. Attach the Baubles to the outside edge of the ring. Add a ribbon bow to the top. Add a layer of baubles to the inside edge of the ring. Turn the wreath over & put extra glue on to the baubles to make sure they are well stuck on. Attach another layer of baubles on top of the outside layer. Fill in the remaining space with more baubles. Hang the wreath on the door.